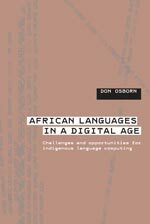 Don Osborn has published “African Languages in a Digitical Age: Challenges and Opportunities for Indigenous Language Computing“. Don is the policy lead within the Anloc project and offers a rich insite into policy, linguistic considerations and technology in Africa. He lead the PanAfriL10n project, the precursor to the Anloc network. Localization is a new and growing field of inquiry. This book identifies issues, concerns, priorities, and lines of research and is intended as a baseline study in defining localization in the African context and how it is important for development and education in the long term. This books is funded bys Canada’s International Development Research Center and is published as part of the Anloc project which is managed by Translate.